These two characters wanted to take a day off from Crappie fishing and try their luck at catching Stripers this morning so they met me at 4:30 to experience the whole process. 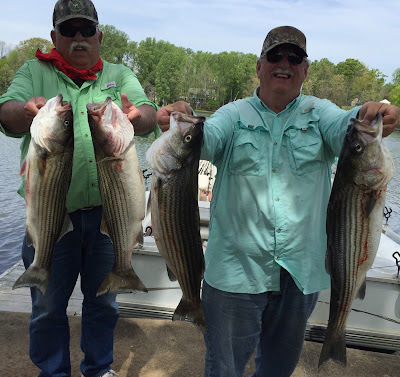 After throwing the net 30 times they figured out catching bait wasn't so easy so we set out a spread of boards and pulled about 3 miles of water looking to catch some nice Stripers. They are holding up a couple of the fish they caught. Good Guys to spend a morning on the lake with.